Who's Bigger: The Biggest Man in Azerbaijan? 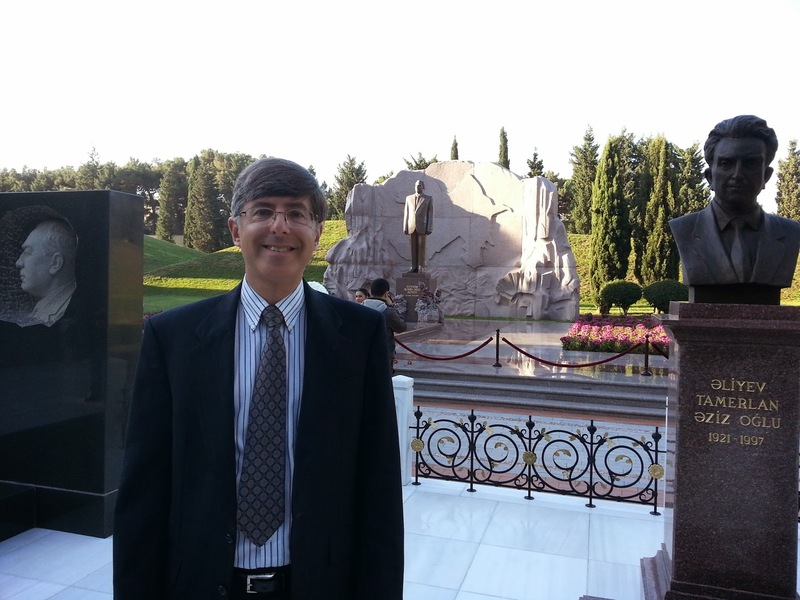 I just returned from a wonderful trip to Azerbaijan, where I served as a keynote speaker at the AICT2013 conference in Baku. The hospitality I received was overwhelming: I thank everyone there for making me feel welcome. The only purchase I was allowed to make during my five days in the country was one bottle of Coca-Cola, and this required my sneaking away during a conference session. Further, they saw to it that I appeared on the local equivalent of ``Good Morning America'' (see photos) and generally made me feel like the biggest man in Azerbaijan. But the ever present pictures of the nation's founding president Heydar Aliyev tell the true story of Who's Biggest. The airport is named after him, as well as the billion dollar Heydar Aliyev cultural center designed by Zaha Hadid. 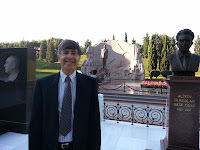 The opening ceremony of AICT2013 included a visit to the president's grave, where each participant was given a carnation to place by his tomb. We rank Heydar Aliyev as the 17,917th most historically significant figure of all time, an impressive showing for a twenty year-old country with only nine million people. His son Ilham Aliyev took over upon his father's death in 2003, and now himself ranks 20,860th. I presented my hosts (Abzetdin Adamov and Shamil Mehdiyev) with signed copies of ``Who's Bigger'' as a small token of my appreciation. With a ratio of one copy per 4.5 million people, Azerbaijan currently ranks as the world's biggest country in copies per capita! We hope such ratios will decline worldwide after our official date of publication, December 4, 2013.